This lasagna with meat sauce is both mouthwatering and filling, but not overloaded with calories, fat and sodium. Make this wonderful meal for dinner and save the leftovers for lunch. In a large skillet over medium heat, cook the ground meat, onion and garlic until done. Drain fat from pan. Stir in tomatoes, tomato paste, wine and oregano. (Season with salt to taste.) Heat to boiling, reduce heat to low, cover and simmer for 20 minutes. In a medium bowl, combine ricotta cheese, egg and Parmesan cheese. Mix well to blend. In the bottom of a 12x8-inch rectangular baking dish spread 1/3 of tomato sauce. 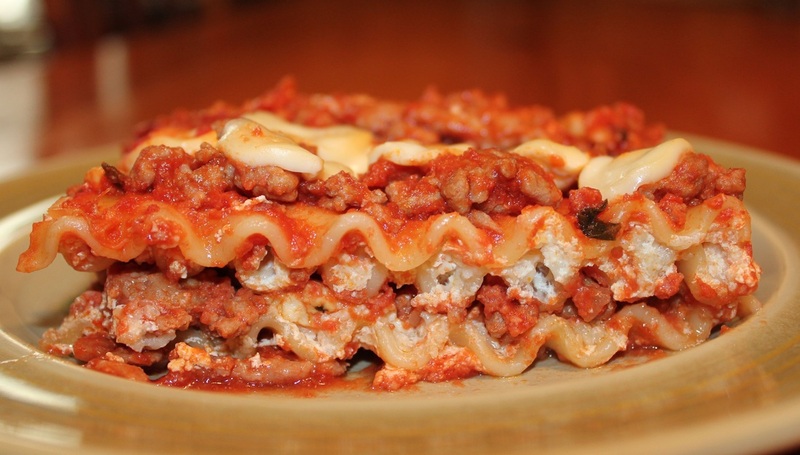 Cover the sauce with 3 uncooked lasagna noodles. Top with 1/2 the cheese mixture, then sprinkle with 1/3 of the shredded mozzarella cheese. Spread 1/2 the remaining tomato sauce on top of the cheese. Top with 3 more uncooked noodles. Spread the rest of the cheese mixture over the noodles and top with 1/2 of the rest of the mozzarella. Top with the last 3 uncooked noodles and spread with the last of the tomato sauce. Top with the rest of the shredded cheese. Cover with foil. Bake in a pre-heated 350 degree oven for 55-60 min. (or until lasagna noodles are tender). Let stand 5-10 minutes before serving. If you wish to make this meatless, just skip the ground meat and continue following the rest of the directions.